Rhonda Mason, author of the hugely popular The Empress Game, recommended Ambasadora during a discussion on her Lady Notorius blog about subgenres of science fiction. 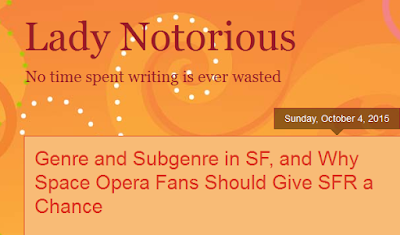 It's a great post highlighting just how an author tries to explain what she writes to audiences with multiple levels of interest and understanding about SF. To check out the first book in the Ambasadora series, Marked by Light, and some reviews, visit Amazon.